The vastly skilled sword masters from Marto have made this faithful and exclusive reproduction of the fantastic Fathers Sword. With this sword Conans father taught the boy everything he would need to know, from how to handle and use a sword, to what it means to have an armorers spirit, as the extraordinary movie CONAN THE BARBARIAN tells us. The carved metal cross represents the Irish moose cranium, and its handle reproduces the joined hoofs of this animal. The hilt shows the plaited lining of antique tanned pork leather. 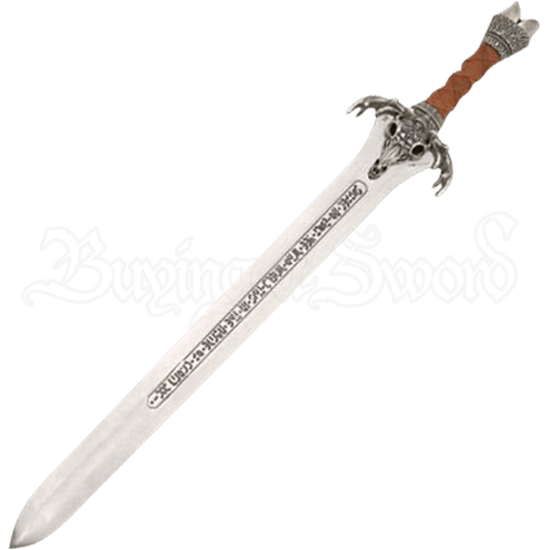 The blade, deeply engraved with the original runes, is dedicated to Crom, the God of the steel. The runes read as SUFFER NO GUILT YEE WHO WIELD THIS IN THE NAME OF CROM. 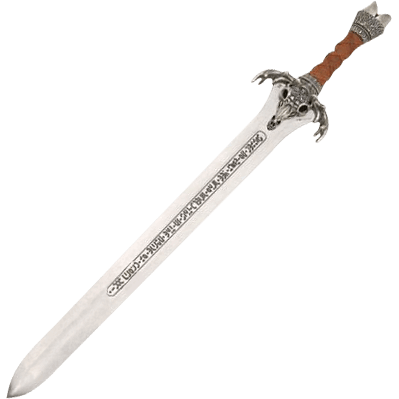 Exciting and intriguing, the Silver Conan Father Sword by Marto is a flawless piece of movie memorabilia that is sure to excite collectors.